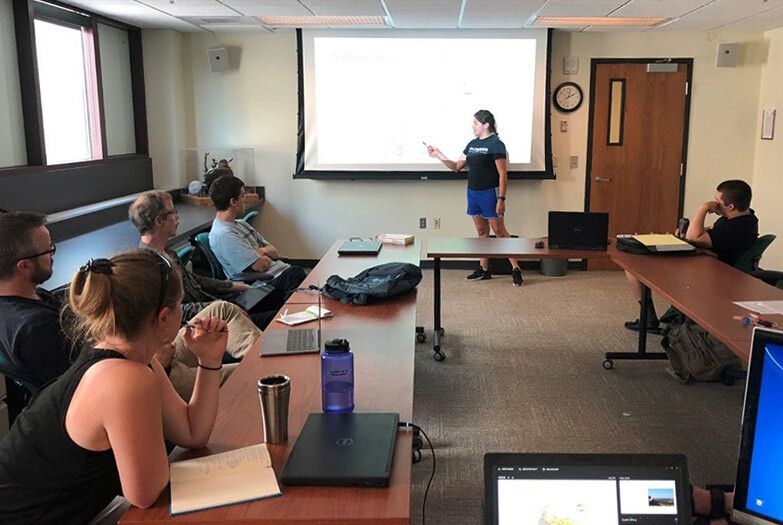 Master’s student Jazmin Castillo presents about her ecotourism research in Botswana to professors and other students in the NRT laboratory. All NRT students must fulfill the requirements of their home departments and fulfill the requirements of the NRT program to retain funding. As a graduate student, you should monitor your progress on your degree milestones as listed on the Office of Graduate Studies website. This site also provides the forms and deadlines critical to your degree program. You should set an appointment with your advisor in your home department to choose courses in your department while meeting the following requirements of the NRT program. Pathways course elective in a discipline outside your major (required to take a 1-semester course for 3 credits) – may take 2 courses for 6 credits. Below are the recommended courses. Be in discussion with your advisor about other courses that could serve as a pathways course. Minicourses – must take 3 (each course runs 2-4 days and counts as 1-3 credits). Below are recommended minicourses. Be in discussion with your advisor about other minicourses that could be an option. Online short courses such as "Numeracy" and "Bridging Science and Practice"
By the end of their first semester, students should have both their major advisor from their primary department and a coadvisor from another academic unit on record. By the end of their first year, students must turn in a proposal for their thesis or dissertation. Master's students will present about their project to the rest of the NRT at the end of their first year; Ph.D. students will present to the NRT at the end of their first and second years.